William Shatner as Capt. James T. Kirk in the "Star Trek" episode "Plato's Stepchildren," which first aired Nov. 22, 1968. In speaking with Space.com about his new book, "Live Long and …: What I Learned Along the Way" (Thomas Dunne Books), released Sept. 4, William Shatner discussed everything from his incredible life journey to President Donald Trump's recently proposed Space Force. Shatner, known by "Star Trek" fans from his iconic role as Capt. James T. Kirk of the starship Enterprise, continues to lead an extraordinary and adventurous life at the age of 87 (though, given his energy and passion for life, you'd never guess his age). But in 2016, Shatner had a serious health scare: a prostate cancer diagnosis. William Shatner, who is best known for his iconic role as Capt. 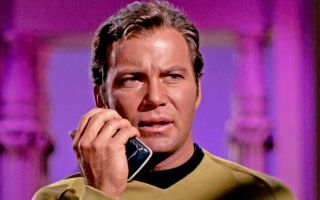 James T. Kirk in "Star Trek," recently released a book following a major health scare in 2016. In speaking with Space.com about the book, Shatner revealed his honest thoughts about the proposed Space Force. Shatner spoke about a line in the book in which he tells readers, "don't follow my advice" — which might discourage hard-core Trekkies, who look up to Shatner as they look up to Capt. Kirk. But while "Star Trek" fans might want to try and follow in Shatner's footsteps, he said, "You can't do what somebody did. You have to do your own [thing], make your own path." The book details Shatner's wild life as an actor, musician, producer, director, writer and so much more. He doesn't intend for readers to look up to him or replicate the stories he tells about his life in the book, he told Space.com — rather, he seems to paint a picture of how incredibly diverse and nontraditional one man's life can be. And that continues to be true of his life. In his discussion with Space.com, Shatner also shared his opinions on the Space Force, a proposed sixth military branch that would be dedicated entirely to security in space. Shatner said he's "of two minds" on the matter. On one hand, the Air Force wasn't a separate branch initially, "and I suppose traditionalists would have said, 'What are we doing, more bureaucracy?'" Shatner said, likening the creation of the U.S. Air Force to that of the proposed Space Force. "There is an attempt to say, 'There we go, another part of the government and more taxes and more people.'" However, he said, "on the other hand, space is becoming a separate place. … We're now realizing that shooting wars may very well … be a thing of the past." Shatner spoke about how traditional warfare might be increasingly replaced by "electronic warfare," or cyberattacks, in which countries target and attack everything from electrical grids to satellites and secure information. "I think that's a good idea," Shatner said about Space Force as a means to combat these emerging forms of warfare, "but they'd have to put more things in it than just a rocket going into the sky. … If the Space Force was all the modern things that aren't bullets, [if] all the separate and secret means of warring on an enemy were separate, that could be a good idea." So, essentially, Shatner is on board with Space Force, though he is partially hesitant about how it might be executed. Shatner's book "Live Long and …: What I Learned Along the Way" is now available on Amazon.